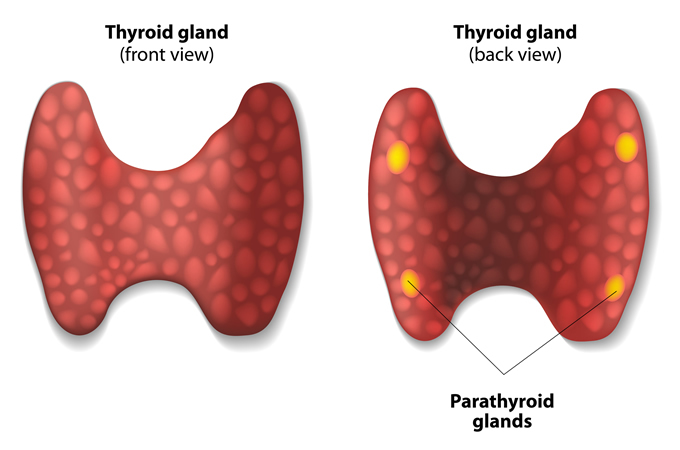 The parathyroid glands are located adjacent to the thyroid gland in your lower neck. They produce the parathyroid hormone (PTH), which is essential for regulating calcium levels in your body. PTH allows calcium reabsorption by the kidneys, causes the bones to release stored calcium, and increases the amount of calcium absorbed by the gastrointestinal tract. If the parathyroid glands become enlarged or develop tumors called adenomas, the gland may produce too much PTH. This is known as hyperparathyroidism, which can cause high calcium levels and resultant serious medical complications. Several diagnostic tests are available to identify and localize problems affecting the parathyroid gland. An ultrasound can be used to identify adenomas on the parathyroid as well as any concurrent nodules affecting the thyroid. The relatively low image quality, however, can make it difficult to visualize certain types of adenomas. Magnetic resonance imaging (MRI) studies can provide high-resolution images and are highly effective in identifying parathyroid adenomas. Sestamibi imaging is a highly sensitive scan for locating parathyroid adenomas. This type of scan involves administering a radionuclide and then using a gamma counter to identify areas of significant uptake of the radionuclide in the neck, which indicates abnormal tissue. CT imaging using radioactive contrast can be used to visualize the glands and nearby structures. This is most often used in cases of recurrent disease or where other studies have failed to identify an adenoma. Venous sampling from the internal jugular veins on both sides of the neck can help determine the side that the adenoma is located on based on the differing PTH levels in the samples. The primary treatment of hyperparathyroidism is a parathyroidectomy. This is a surgical procedure involving the removal of portions of the parathyroid gland with the goal of normalizing PTH and blood calcium levels. If the hyperparathyroidism is caused by an adenoma, the tumor is removed while preserving as much of the remaining glands as possible. Some surgeons choose to explore and visually inspect all four parathyroid glands for the presence of adenomas. An alternative approach involves localizing the adenoma preoperatively. The abnormal tissue is then excised through a small incision in the middle of the neck. If the localized approach is used, the surgeon will use blood or radionuclide imaging to confirm that all of the diseased tissue has been removed. If the hyperparathyroidism is the result of enlargement or hyperplasia of the parathyroid gland, a parathyroidectomy is used to remove the majority of the gland tissue. One approach removes all but half of one of the parathyroid glands. A second method involves removing all four glands and then re-implanting a small portion of one gland in the forearm or neck. As with any surgery, the risks associated with a parathyroidectomy include a potential reaction to anesthesia, post-surgical infection, and bleeding. On rare occasions, the procedure may result in hypertrophic or keloid scarring and damage to the laryngeal nerve, which can affect vocal cord function. In some cases, removal of the parathyroid glands or damage to the remaining portion of the parathyroid can cause blood calcium levels to drop too low. This is typically treated with calcium, vitamin D, and magnesium supplements.